Look, up in the sky, its a bird, its a plane, its a….Drone? Yes, your eyes are not deceiving you, it is in fact, a drone hovering above looking for an ideal spot to drop off your latest Amazon purchase. 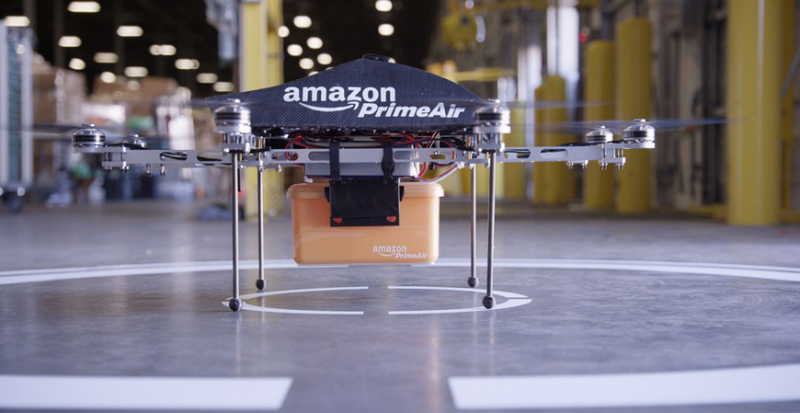 You guessed it, Bezos and Company have recently stated that they are close to achieving the technology that will enable them to deliver packages to your doorstep, via an un-manned drone. As amazing as this futuristic accomplishment sounds, it only gets better… they plan on promising delivery in as little as 30 minutes from the time you press the ‘pay now’ button on your computer! Jeff Bezos’ is a visionary, a renaissance man with unlimited capital and he wants to change the world for the better. His company has grown 10 fold in the last 8-10 years, and has revolutionized the online shopping experience, cushioned the bottom lines at companies like UPS and Fed Ex, and created many a millionaire employees. I, for one think if anyone can do this, its Jeff Bezos and his loyal soldiers at Amazon. Receiving a package you just bought on your computer 30 minutes ago is “Pro” enough. Talk about excellent customer service! Keeping you from having to fight those pesky, overzealous, Black Friday shopping maniacs is “pro” enough. This will give a new meaning to last minute Christmas shopping. The advent of ‘delivery parties’ will ensue, where men gather together outside, drink beer and await the deliver of their wife’s Christmas presents. You laugh, but trust me it will happen especially when football is not on! For starters, you can almost guarantee their will be some crash landings, wrong deliveries, theft, and power line entanglements, these are the obvious. It’s the likelihood of mischievous behavior at the expense of one very expensive drone, that you may not have thought of. Take for instance a rural area with deer hunters, and say a few hunters are having an unproductive day when a drone flies by…target practice anyone? I’m just sayin! Kyle, from rather-be-shopping.com refers to this as shoot and shop, and he is right on the money, this will become a favorite pastime! There is certainly going to have to be cameras mounted on these drones, which will likely cause privacy concerns. Folks are not going to take to kindly to drones monitoring their every move. A crash landing into a house, a car, or an individual is something we are sure to count on. Liability insurance costs for Amazon will surely increase, so needless-to say, this cost will be passed on to the consumer in the form of higher merchandise and delivery costs. The FAA is cautiously opening the door to domestic drone use. There have already been successful domestic deployment of drones by firefighters, search and rescue teams and disaster relief instances. Drones have immense potential, although the technology has some maturing to do. That said, Amazon is well positioned to capitalize with it’s vastly deep pockets and pioneer mentality, look for Bezos to get the job done. Look forward to these Amazon drones as they are sure to be altering the cityscape in the near future. On the flip side, thanks to those who chose to include my posts in their carnivals! Knsfinancial.com Yakezie Carnival for 12-15-13. Here are a few compelling posts I read last week! I couldn’t imagine that we are so technologically advanced that this could actually happen, but I guess we’re almost there. I heard about this on the radio on Halloween, actually. It’s definitely going to set some expectations about the delivery process for online shopping. The drone delivery would probably cost a lot more than regular delivery too. Yea I am thinking that the increase delivery costs will end up costing the consumer more in the long run, so maybe we can just be patient and wait another day for our packages? I’m blown away that there is a market for this sort of just-in-time delivery, when traditional methods can already offer next day or even same day delivery for some items. I suppose that’s just the old fogie in me talking though. Progress marches on. You got it Doneby, next day delivery is soooo 2013! Too Funny! It was a good PR move for Amazon! As it stands, this is currently illegal. Even the ad was shot outside the US! Interesting, well guess they will need some politicians to change the law! Hilarious, I will have to read that post, maybe even link to it, what a gas!! hahah, “shoot and shop”- that’s hilarious. I can’t wait to see how this drone thing plays out. I think it’s exciting. Yep, getting more like the Jetson’s every day! Google Glass, Drone deliveries, Bitcoins, what is next? I honestly do not understand the logistics of having drones deliver packages. So many things can (and will!!!) go wrong. Those drones can also be used to spy on us, under the guise of delivering packages. Im with ya Charles, exhibit A: the NSA Spying scandal!! BAck in the prior decades, I couldn’t believe we’d see the day where we could talk live through a “picture phone”. Now, it’s no big deal. I’m not surprised by much anymore, I expect to see a drone on my porch in the future. Who knows Barbara, soon these drones may be serving divorce papers, evictions, and collection letters, among other things. It’s hard to imagine! I am going to have to side with the cons, although it does sound pretty awesome. If we are able to do this, then we can finally say that we have reached the future, or at least the first step into the future. Yep David, we are in a technology revolution and I believe it still has a considerable way to go. As they say; the internet is in infancy, hard to imagine what can come next, I am still stuck on the fact that you can send a picture to someone else’s computer in a jiffy? © 2012 to 9196 Critical Financial. All rights reserved.